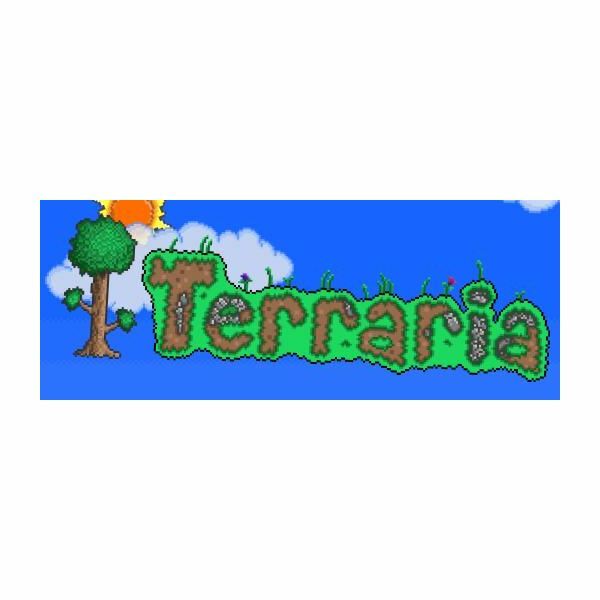 When I first fired up Terraria on my PC, my first emotion was excitement toward playing the game. That was followed by fear, because I don’t have the best tech in my computer, and every time I download a new game, I fear that I won’t be able to enjoy it. Luckily, Terraria’s 16-bit visual style posed no problem for my subpar graphics card, so once I saw everything running smoothly, excitement took over once more. 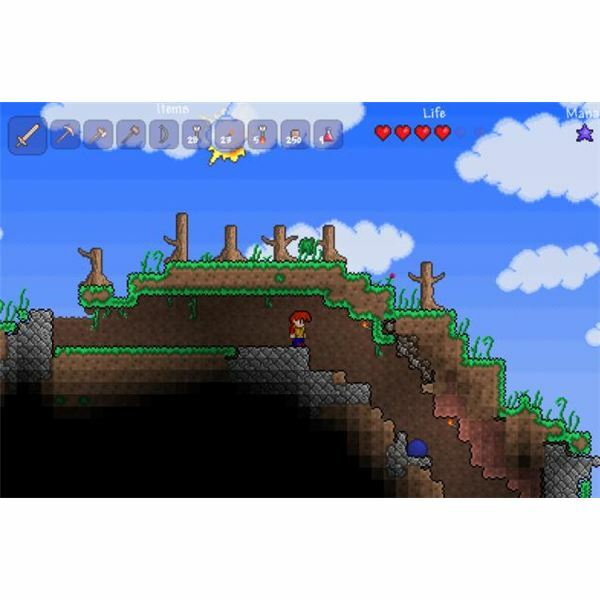 Terraria has been dubbed the “2D version of Minecraft” by many a gamer, and judging from the trailer indie developer Re-Logic posted, it is completely understandable why most people would call it that. Upon closer inspection, however, it quickly becomes clear that Terraria is a completely different animal. Your first order of action in Terraria is to create a character. The edit tools for making your very own protagonist are fairly simple, giving you different hairstyles to choose from and allowing you to modify your in-game hero’s clothing colors. After you’ve got your character just the way you want him, you then create a new world. You simply name it and choose between a small, medium, or large world, and off you go into a randomly generated land. Upon getting tossed into your very own custom world you realize that you literally have an entire map to play around in. Even the smallest world is massive, and there are plenty of sights to see and countless things to do. Before you can go off adventuring, though, you must build a shelter. This isn’t exactly a requirement, and the game literally lets you go on about your business as you see fit, but it is highly advised that you begin Terraria by collecting the proper resources to build your very first dwelling. This is because once nightfall comes, the land is overflowing with zombies and Demon Eyes, big flying eyeballs that deal a lot of damage. In order to get started properly, you should have a brief chat with the town guide. This helpful fellow explains the basics and gives you the knowledge necessary to get started in the world of Terraria. At your disposal are an axe and a pickaxe. These can be used to chop wood, tear down walls, and collect stone. After building the walls of your house, you must build a craft bench so that you can get to work on the tools you’ll be utilizing as you progress through the game. Torches will light your house, wood can be turned into inner walls to keep enemies from spawning within the confines of your abode, and chairs can be crafted to provide some daily comfort (in essence; they actually don't do anything). Don’t get too comfortable in your new place, because the moment you build your first house, the guide decides he’s moving in. You can still stay there during nighttime, and there are no real rules regarding the living conditions, so feel free to make that home your sanctuary. Performing certain tasks within the game will make more NPCs move into town, and you’ll definitely want to take advantage, because you can acquire a nurse, a merchant, and an arms dealer, and you can bet these folks will come in handy. Though you can definitely follow the steps I mentioned above–and I would suggest at least building a house first–if you’d rather just have fun and go exploring, you can do so. Terraria provides you with a giant sanbox, and you can mold your custom world as you see fit. Want to build a strip full of houses? You can do that. Want to go hunting for baddies in the form of slimes and zombies? Go right ahead. Perhaps you’d rather dig deep underground to search for useful resources and make some strong armor. Terraria encourages you to play as you’d like, and by tearing down all restrictions, it provides an experience that gamers of different tastes can really enjoy. This is the type of title that dedicated gamers can spend hours at a time playing, building armor for their characters and hunting the game’s elusive beasts. Alternatively, if you’d rather take things slow, you can do just that. I probably sunk about two or three hours into Terraria before I started really exploring the depths beneath the ground in my world. This is the type of game that lets you do what you want, and it’s a great deal of fun. 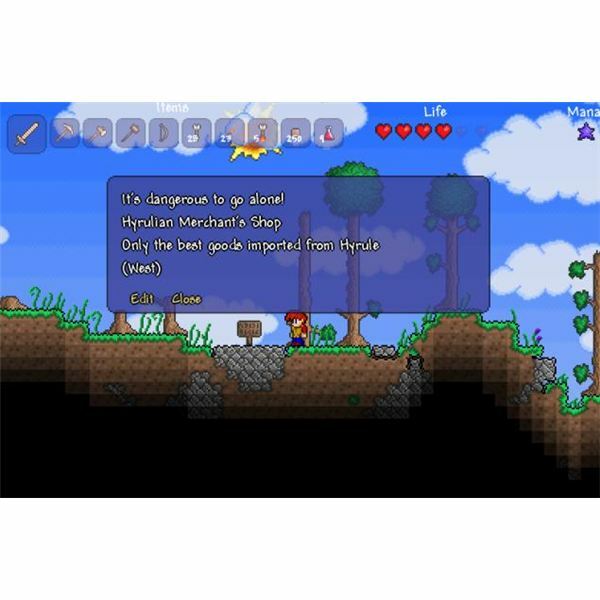 Terraria brings together several elements from the action-adventure and RPG genres. Like many classic side-scrolling action-adventure games, this indie game offers plenty of combat and platforming. There are no puzzles per se, but when you find yourself burrowing deep underground, figuring out the best way to dig without trapping yourself beneath the earth is a puzzle in and of itself. Already the game has drawn comparisons to the classic Metroid games and Zelda II: The Adventure of Link. So if you’re a fan of 8-bit and 16-bit games like those, you’ll find the combat and exploration of Terraria quite pleasant. The game’s RPG elements kick in when you look at your character’s stats. You don't level up in a traditional sense, but by collecting resources, you can build strong armor for your little explorer. You can also sell these minerals and just buy some sweet gear from the town merchant after he moves in. You can also find crystal hearts in the darkest depths of the underground world, and these can be used to increase your life. Additionally, fallen stars will increase your mana once you’ve accrued a total of 10. There is a lot to see and do in Terraria, and it is up to you to figure out how you want to go about doing it. Currently, Terraria is still in its early build. Though the game certainly looks and feels complete, Re-Logic has confirmed that free content updates will be patched into the game. So you can expect a lot more game down the road. Even now, though, Terraria may very well be finished, because it is just utterly engrossing. You can dig, dig, dig, or you can just collect minerals. Different players are currently having different experiences with the game, and that’s not even including the multiplayer. Terraria is a solid game, and although it may appeal to the Minecraft crowd, this is definitely a different game. Head on over to Steam and be sure to check out this enjoyable and charming sandbox action-adventure game. Just be prepared to say goodbye to your social life. I know I have.